London’s mayor takes the best selfies. He’s also brilliant, down to earth, charismatic, witty, and a genuinely kind person who cares deeply about the future of the world we all share. Sadiq Khan is the first Muslim Mayor of London. This fall, he came to Chicago as part of his first international trip to North America. I’ve been a fan of Mayor Khan’s for a while. When the Interfaith Youth Core presented me with the opportunity to meet him in person, and to bring two of my students, I couldn’t say no. But who to choose as my guests? Which two, out of my many wonderful students, would most value being present for such an historic occasion, and be available to go? It was homecoming weekend, after all. To my great delight, the two students at the top of my list were both able and eager to go. Together we formed our own little interfaith, and international, delegation. Our troupe represented Islam, Christianity, and Unitarian Universalism, and Chicago, Burundi, and Sarajevo. On a sunny, beautiful September day, we traveled to Temple Sholom Synagogue. There, we spent the morning in the company of Mayor Khan and dozens of students, campus staff, and community friends who — like the Honorable Mayor himself — are committed to building interfaith bridges. Humanity in all its variety gathered to hear what he and others had to say. From youth and seasoned elders, people of all faiths and none, with smiles on our faces and optimism in our hearts. My students, as campus leaders and resident advisors, are familiar with how difficult this can be. When Mayor Khan spoke, there was no rancor in his voice, no despair. There was, instead, enthusiastic hope. He told us tales of interfaith friendships that moved mountains and transformed lives. He talked of actions taken and ideas shared. Mayor Sadiq Khan shared his belief in a future that is defined not by walls of division but by bridges of cooperation. His words reminded us of what is possible when we remember our common humanity, and work together as the kin we are. Have others said this? Yes. But when someone in a leadership position with a lot at stake chooses love over fear, it sets a powerful example. Experiencing it in person can be transformative, especially for students and others in the midst of choosing which pathways they want to walk. 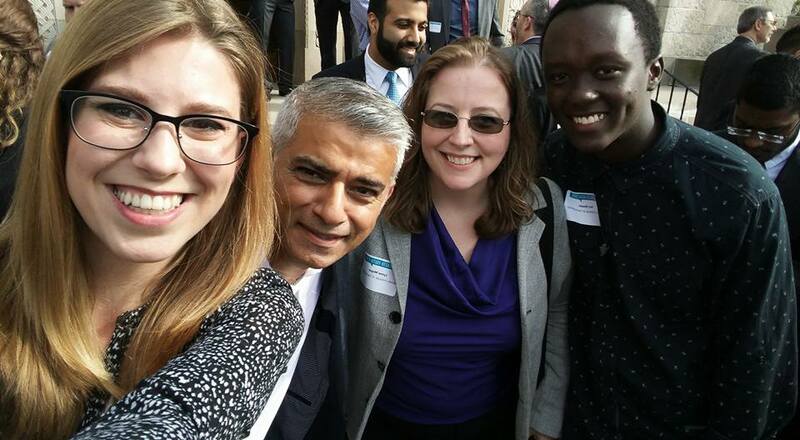 At the end of his remarks, Mayor Sadiq Khan decided that he needed a selfie with us. All of us. We poured out of the synagogue and onto the front steps, and with selfie stick in hand, he took a massive group photo that he later tweeted with great happiness. I expected that to be the end of it. But to my surprise and delight, he patiently, graciously took time out of his very tight schedule to pose for selfies with each and every campus delegation and individual who asked. He made jokes and conversation. Even though each encounter was brief, somehow made all of us feel like we mattered. It wasn’t about him. It was about us, together. As a student affairs professional, I found lessons in that. Value the individual and their uniqueness. Looking ahead to 2017, I find solace and inspiration in my morning with Mayor Khan. I continue to believe in the power of love over fear, in connection and in community. I vow to act accordingly, and help my students do the same. This post is part of our #OneGoodThing series for December. Given the numerous troubling things we have experienced together during the year of 2016, and all of the disagreement, we wanted to prove that 2016 wasn’t all bad. We will hear from #SApros about a memory, experience, or moment that was GOOD that happened to them in 2016. For more info, please see Doug’s intro post. Be sure to check out the other posts in this series too!